. 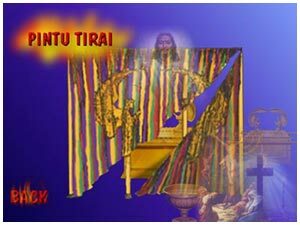 :: Tabernacle Pentecostal Church Kristus Kasih - Malang - Information tabernacle equipment: the veil ::. The Veil is the third door (entrance) in the Tabernacle. Separating the Holy place from the Most Holy Place, the veil is the entrance to the Most Holy Place, the place of the Ark Covenant (God’s throne). When Jesus died on the cross, the veil in the Temple of God was torn in two from the top to the bottom (Matthew 27:50-51; Mark 15:37; Luke 23:44-46). Through the offering of His Body/Flesh (the veil), Jesus as the High Priest has brought us to the throne of God (Hebrew 10:19-21; 4:14-16). He, as the High Priest, has gone through heaven (the Most Holy Place) for only. High Priest is allowed to enter the Most Holy Place (Hebrew 9:7; Leviticus 16:2). The veil signifies the total tearing or crucifixion of flesh. fine-twined linen skillfully worked with cherubim on it. This is the life of the Lord Jesus who was crucified as spiritual man. 4 pillars refer to 4 persons who have undergone the tearing of flesh and were translated/lifted up into heaven. They are Enoch – Moses – Elijah - the Lord Jesus.